2 Rifles, currently based at Al Asad providing infantry, counter-IED, engineering and combat medical training to the Iraqi Security Forces, will now patrol outside the base perimeter. 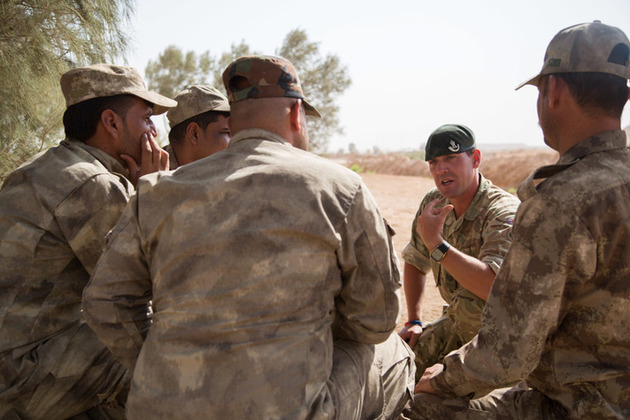 A 2 RIFLES non-commissioned officer briefs Iraqi soldiers before a practical exercise at Camp Al Asad, Iraq. Crown copyright. The UK is also deploying a further team of British military medical personnel to Al Asad and will extend the deployment of British engineers at the base by six months. A Light Surgical team, made up of RAF medics and personnel from the Army Medical Corps, will be able to provide world leading medical treatment to Coalition forces within the critical “Golden Hour” after being wounded. "The fight against Daesh’s reign of terror is not over and as the nature of the Coalition campaign changes, the role we play must adapt too. By training Iraq forces we are helping with the long-term stability of the country and our own security here at home." The campaign to defeat Daesh in Iraq has entered its final phase following the liberation of Mosul, Hawija and the Ninewah Province from its barbaric rule. Iraqi Security Forces are now advancing across Anbar Province, clearing Daesh positions in the Euphrates River Valley. Medical support to operations is a top priority for the Coalition. Learning from previous operations, such as the world leading trauma care developed at Camp Bastion’s hospital, the UK medical personnel will ensure Coalition forces receive the highest standard of treatment if required. Over 600 British soldiers are on the ground in Iraq, helping to train that country’s forces. UK troops have so far helped train over 58,000 Iraqi Security Forces in battle-winning infantry, counter-IED, engineering and combat medical skills. In addition to personnel on the ground in Iraq, RAF aircraft have carried out over 1,600 strikes against Daesh. The UK’s commitment from all three Services to the fight against Daesh across the region now numbers just over 1,400 military personnel.